It does however, require well-serviced disbelief-suspenders on more than one occasion and a certain amount of dropping-jaw resistance. Only to find out shortly afterwards that little boys have pink numbers, too. Mr. Dalal is not happy about the arrival of a daughter. Never mind that people tell him that a daughter is the houses's Lakshmi, he knows that he will not inherit his father in law's shoe factories unless he has a son (This is their first child, I am not sure why the wife's father insist that the first one has to be a son). Also, one day he will have to shell out for her dowry and Mr. Dalal really doesn't like to be parted from his money. 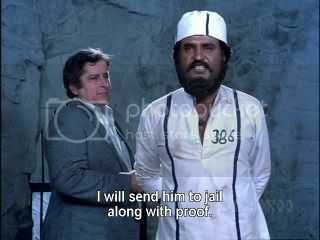 Mr. Dalal is a good friend of the doctor, De Costa (Ranjeet) who runs the hospital, or rather, they are partners in crime, as the doctor isn't really a doctor and peddles in drugs and fake medicines, too. They come up with the plan of exchanging the offending baby girl for an acceptable baby boy. 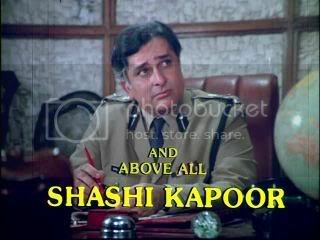 Their choice of baby boy, however, leaves something to be desired, as it is not only the son of Inspector Kapil Khanna (Shashi Kapoor) but the parents had both already seen their child, and are, understandably, unwilling to accept a substitute. Unfortunately, Mrs. Khanna has a heart condition and expires promptly, after having charged her husband never to stop looking for their son. 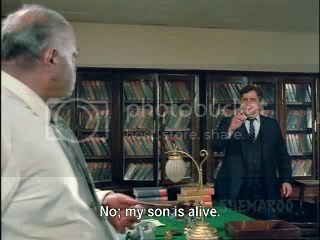 Everybody tries to convince Inspector Khanna that the baby girl is really his daughter, but he isn't convincend and the case ends up in court. 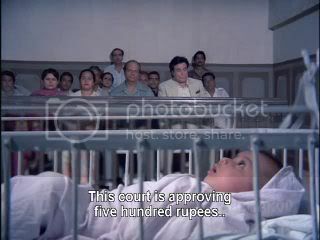 The custody of the girl, now named Lakshmi, is given to one of the nurses from the hospital, Bantho (Aruna Irani), and the Inspector has to pay her 500 Rupees a month. 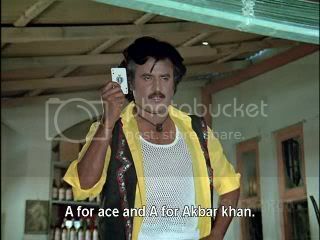 He is less than satisfied with this outcome, but as his search of DeCosta's house, whom he suspects to be a fake doctor doesn't yield any results, he asks a prisoner, Ahmad Khan (Rajnikanth) to look for evidence in DeCosta's house. Ahmad manages to find the safe, which is cunningly hidden behind a bad picture in the bed-room (honestly, what an original idea, I can really see why nobody else would have been able to find it) and opens it by hitting his hands and head against it, but he is still found out and it all ends rather less than well for him. DeCosta and Dalal engage Bantho's husband (Satyendra Kapoor) to confess to Ahmad's murder and go to prison for a substantial sum of money. They do actually pay him, maybe because he isn't upright and honest. The Inspector isn't happy about this development. He tries to look after Ahmad's son Azam, but the latter holds him responsible for his father's death and swears to avenge his father. 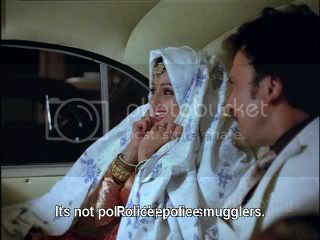 Inspector Khanna really doesn't have much success with children. Time passes, the baby girl, now named Lakshmi, grows up to be Sridevi. She spends most of her time conning people, for example by pretending to be a statue of the goddess Lakshmi, and then running off with all the offerings. When her foster father, Bantho's husband is released from prison, she cons him out of his payment, but he isn't to upset, as the money stayed in the family. Bantho is never physically abusive or even mean to Lakshmi, but she also makes it very clear that her main reason for raising her is the money. 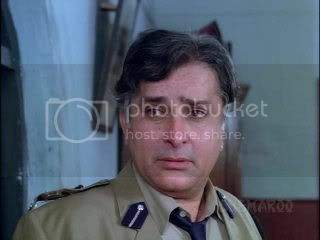 Of course, Lakshmi would really be part of a loving family, but the only other candidate for the position of parent, Inspector Khanna, whom she knows as that custody case seems to be still dragging on, isn't willing to accept her has his daughter as he thinks that that would indicate that he has given up looking for his son. Talking of son, where is that son? This question is answered in our first dance number, which involves a clock and more sequins than you ever wanted to see. 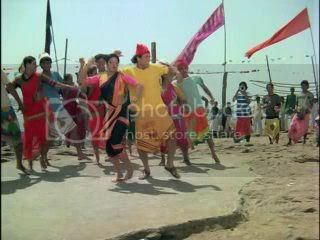 The dance is recorded for a charity event for DeCosta's hospitals and it involves Om (Govinda), Dalal's son, and DeCosta's daughter Reeta (Kimi Katkar). Their father's would really like the two to get married, but Reeta isn't to happy about this idea. Meanwhile, Om and his father have developed a method of making money from marriage proposals. They accept a proposal, demand half the dowry in advance, then break of the engagement and return the money using fake notes. However, a hero is available to rescue Reeta. It is Azam, son of Ahmad who grew up to be the very image of his father. Reeta gives Azam her address and some time later he turns up at her house, mainly because he wants to know the name of his father's killer. DeCosta and Dalal give him the name of the person who served the sentence for the murder and he goes to see him. Bantho's husband is quick to tell that he was paid for going to prison and also gives Azam the name of the person who paid him. Of course, this doesn't bode too well for the love between Reeta and Azam. 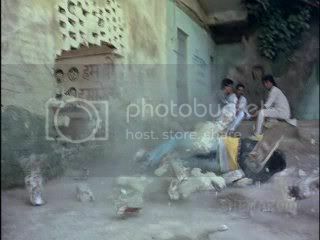 He then tells him about the girl he brings up, and Azam is so shocked by his greed for money, that he spontaneously jumps through a conveniently placed brick wall. 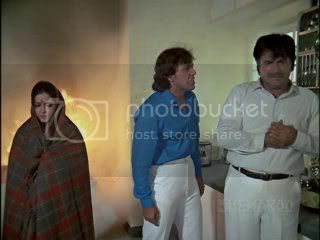 In a different part of the plot, Om and his father are conned by Lakshmi who pretends that she was hit by their car, and then proceeds to demand compensation as well as nicking Dalal senior's wristwatch. While she pretends to be passed out, she overhears the whole dowry plot. Dalal senior is taken in by her act, the son isn't. Meanwhile, Lakshmi's foster mother has marital problems as her husband doesn't only drink, he also visits dancers. Lakshmi goes to see him, and ends up in a fight with the dancer, giving her a black eye. Unfortunately, the dancer urgently requires money for an operation her mother needs, and was meant to dance at a great function the next day. Lakshmi, being a decent person at heart, offers to dance instead. The law of movie coincidence dictates that this function takes place at the Dalal's home. Lakshmi is somewhat embarrassed to be in the home of the two people she conned but she recovers quickly and proceeds to steal various bits of jewellery from the guests. At the end of the evening when she is extracting her loot from various bits of her dress, she is abducted by a group of goonda's employed by the real dancer's boyfriend who objected to her dancing at this function. They take her to an underground parking lot, but Om turns up in time to rescue her. Lakshmi even gets to join in the fight after she has fortified herself with some Dutch courage. Back at the hospital, Azam tries to convince Reeta that loving him isn't a good idea. He descibes himself as a living corpse and points out that dead people don't marry the living. She insists that he can't stop her from loving him. 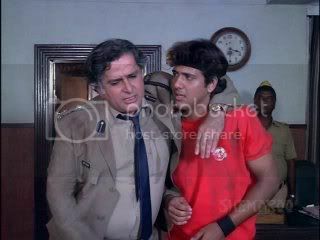 With this conflict unresolved, Azam sets off to confront Inspector Khanna. In a sequence that strained by disbelief suspenders to breaking point Inspector Khanna actually beats up Azam and has him arrested. The next day, Lakshmi meets Om as she is about to steal a motorcycle, and he pretends to have been blinded due to the chili powder incident. As they escape from the irate motorcycle-owner a bond forms between them and once Lakshmi works out that he isn't really blind, they share a song. Luckily, I was able to follow the plot without too great difficulty. 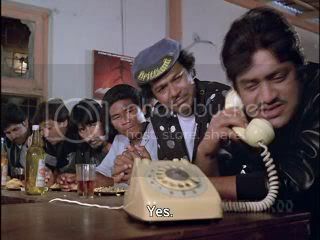 We rejoin the movie with Inspector Khanna thanking Om for saving his live. As assorted henchmen and Azam are now in prison, it would seem that they made an attempt on the inspector's life. He suggests that Om should join the police, Om thinks that this might not be such a bright idea given his current activities. 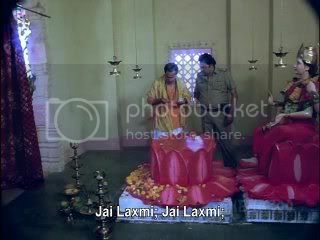 Lakshmi, meanwhile, is visiting a temple and promising to give up her illegal activities. As she wistfully yearns for her mother's blessing who should turn up but Mrs. Dalal. 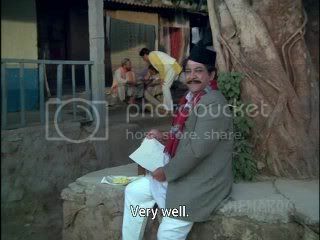 She drops her mangelsutra, and when Lakshmi tries to return it, Mr. Dalal accuses her of having stolen it. The newly reformed Lakshmi ends up in prison, much to her irritation. While she is being held, Mr. Dalal ends up in hospital as he has kidney problems and may need a transplant, and the rejected future in-laws who had been given false notes (who you might vaguely remember from earlier on) turn up at the police station to file a complaint against the Dalal's. Of course, Lakshmi know all about it and offers to help to set up a trap for them. Inspector Khanna at first has his doubts, but they decide to work together. They put an ad in the paper that an African princess is looking for a husband. 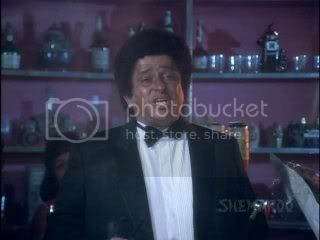 The Dalal's go to meet this princess and her father in a club, and if you ever wanted to see Shashi, Kader, Govinda and Sridevi in blackface and bad wigs, there is a whole song of this for you to enjoy. 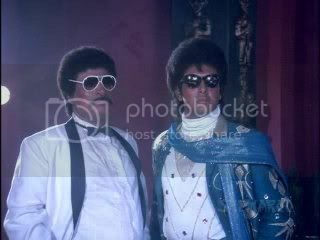 After the song, all identities are revealed, but Om is guilted by his father into taking the blame and going to prison. 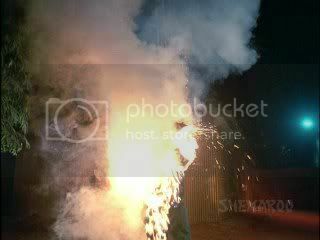 Of course, in the interest of further excitement, this happens to be the prison which currently houses Azam. The two come to blows fairly swifly and after a night spend dramatically shouting abuse at each other across the corridor while chained to the wall, they get to share a table at breakfast with unfortunate consequences for Om. 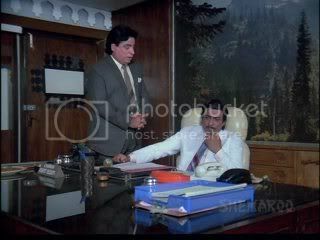 After another visit at the lawyer with the untidy bookshelves, Inspector Khanna arranges that Om is going to be released from prison once he has recovered from his injuries. While he is still at the hospital he gets a visit form Laksmi, who is rude to the nurses for no apparent reason other than that it is meant to be funny. However, their romantic interlude is swiftly interrupted by the arrival of Mrs. Dalal. Mrs. Dalal approves of Lakshmi, but is worried, because she has no parents with whom she could arrange a marriage. Lakshmi does not see the need for parents and goes to meet Mr. Dalal herself. Time has not softened Mr. Dalal's view on daughters, which does include daughters in law: They cost money and he wants nothing to do with them. As he throws Lakshmi out of the house, she curses him. 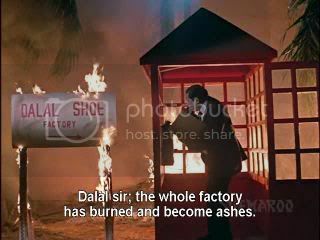 Promplty, he receives a phone call that his shoe factory, which seems to consist of a sign and a small booth, is burning down. Fortunately, he has a small heap of shoe boxes in his living room, so he can dramatically kick them. I am sure this is something every industrialist keeps in his home. Mrs. Dalal is understandably concerned about this turn in their fortunes, but then makes the mistake to state that she would give her life for her husband. He then proceeds to try to burn her for the life insurance money. Luckily, Om appears just in time to rescue his mother, and leave the house with her. What will happen to Mr. Dalal? Will his malfunctioning kidneys ever become important again? Will parents be re-united with their children? Why does Mr. Dalal kidnap Rita, and why does DeCosta kidnap Lakshmi? And who thought these glasses were a good idea? Is this a good movie? Well, no, not really. Is it an entertaining movie? Oh yes, it is. The plot moves along at a good pace and there are not too many loose ends, especially not for a product of its period. There is mercifully little comic relief, the songs are catchy,and while some of the plot is more than a little on the bizarre side at least people act in character, even if it is the character of a cartoon villain. 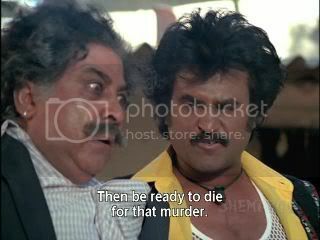 I had never seen a movie with Rajnikanth before, so that was an interesting experience, as well. Blackface, wigs, Shashi and kimi! i have to see this now! 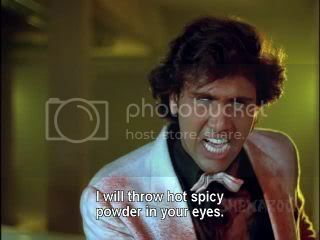 Bollyviewer -- Govinda is quite cute here, well, at least to my eyes. And there is Sridevi. I had a look around on youtube for the bad wig and blackface song but no luck. Lots of other strange stuff, but not that. Oh dear heavens! 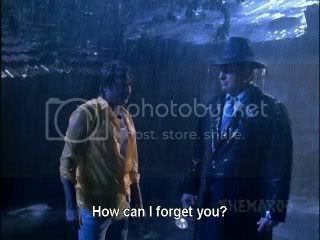 I can't believe Shashi and Rajnikanth are in the same movie. 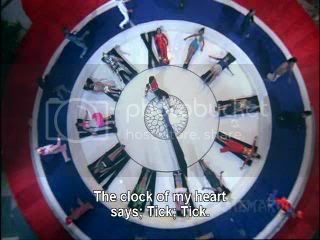 I must see the clock/glitter song, and my inner four-year-old might love that dress even more than Zeenat's in Dharam Veer. 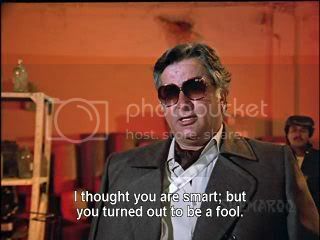 You really do take one for the team a lot when it comes to aging Shashi (though he does still look pretty dishy here, at least, and I bet he's the least bad of all the actors). Beth -- I have come to like Shashi in these more fatherly roles. Yay! And I love it just from the scene that appears as it loads - the silhouette of someone (I assume Govinda) in a sparkly jacket against what sure looks like Tower Bridge! Hello reader, a couple of things about me and this blog: I am not the most prolific of posters, two or three posts a month is about the average. 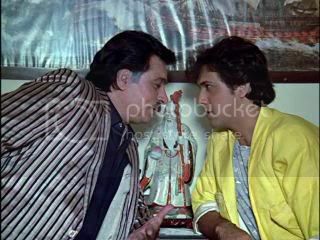 I write about movies I enjoyed watching, not all of them featuring Shashi Kapoor (though it seems that way recently, doesn't it), but mostly older ones. This is not the place to look for a review of the latest movie to hit the cinemas. Also, for historical reasons (and due to my technical ineptness) I am known as Gebruss almost everywhere else.